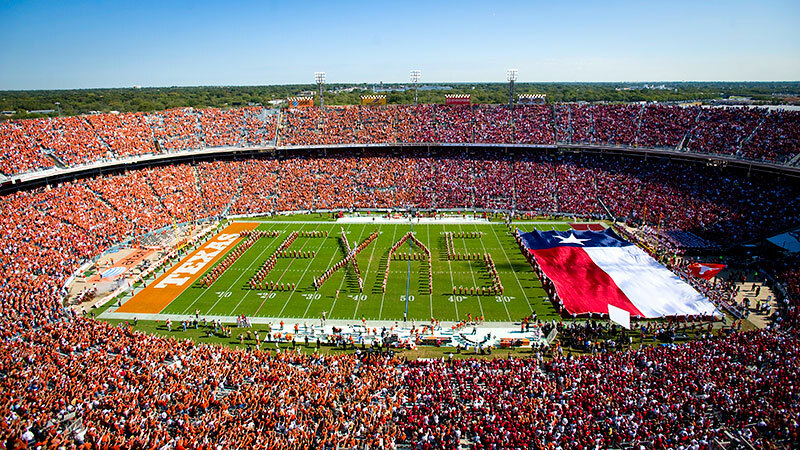 This weekend, the Texas Longhorns and the Oklahoma Sooners will face off in the 112th match-up of one of the nation’s longest-running college football rivalries. For members of the schools’ respective marching bands, this game often represents the “official” beginning of football season, and is a chance to prove their mettle on and off the field. 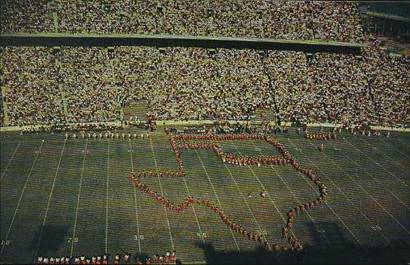 “Texas Weekend” or ”OU Weekend” (depending on where your loyalties lie) marks a rite of passage for many freshman members of both the Longhorn Band and the Pride of Oklahoma, since it’s usually the first away game every season that the entire band will attend. This is true for both bands, who will roll into Dallas on their respective fleets of charter busses early Saturday morning. Though they’ll arrive at Fair Park hours before kickoff on game day, there’s no time for any Fletcher’s Corny Dogs! Instead, they’ll perform last-minute uniform and instrument preparations, equipment and logistics checks, and a final run-through of the day’s music to hopefully calm any nerves. Finally, he said, the Pride will of course provide engaging and entertaining performances during its pre-game and halftime performances, as well as keep OU fans cheering in the stands. 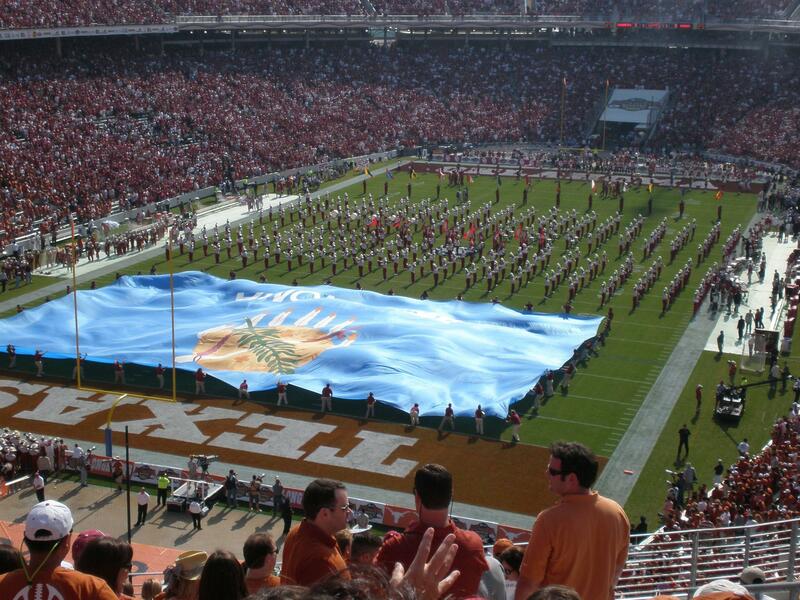 Longhorn Band alumna Bianca Padavick attended her last “OU Weekend” last year as Tau Beta Sigma president, and explained how the game day experience can be vastly different for freshmen and seniors. Padavick explained that her first year, she wasn’t sure what to think of this so-called rivalry, and was skeptical of everyone’s assertions that it would be vastly different from any other game day. A similar change of perspective isn’t uncommon among those who become personally invested in this storied game day and all that it entails. Ryan Lipscomb is a graduate assistant starting his third year with the Pride of Oklahoma, after growing up a devoted Oklahoma State fan. During his five seasons marching with OSU, Lipscomb said he felt they were OU’s primary rivalry. Of course, this storied rivalry has the same thing in common with every other big matchup you’ll see this season: both teams want to win. It’s for good reason, too, since the Red River Showdown is almost always significant for determining the Big 12 conference champion. In over 90% of the meetings between OU and Texas since 1945, at least one of the teams has come into the contest ranked among the top 25 teams in college football. Despite the beliefs of some fans, the game itself is a central aspect for many band members too. Longhorn Band member Tanner Widis said his favorite memory of the rivalry game was last year, calling it a “special experience” to watch a struggling Texas team come together to beat Oklahoma. Beyond just winning, though, this rivalry game brings out a massive display of pride from supporters of both teams. As one of the only college football matchups that takes place in the center of a gigantic state fair, there’s enough school spirit (and fried food) to go around for fans on both sides. Lipscomb pointed out that it’s a different experience for students and fans to attend other rivalry games, since these spectators are usually either part of a vast majority of home fans or a tiny minority of visitors. Upon crossing the 50-yard line, though, she said this booing almost instantly turns into the loudest cheering imaginable. Both bands also battle it out to see who has the largest state flag. Since one endzone is painted per school, the bands use their large flag to cover up the other school's name in the endzone in what is always a fun moment during pregame. No matter either team’s record coming into this rivalry game, it seems both fan bases will never fail to appear en masse to support their school with gusto. Outside of the game itself, there is plenty of fanfare wrapped up in both bands’ traditions for the days and weeks leading up to their trip. During game weekend, both bands will perform an exhibition rehearsal at a high school stadium, which is usually attended by many local fans and band families. The Pride will also be attending an event at the OU Club of Dallas, before hosting a party where their students can burn off some excited energy. Brookins said the band devotes an entire “Texas Week” to getting hyped for the big game, including dress-up days at rehearsal. Despite the game’s outward appearance as a feisty rivalry, each of these two great band programs has a lot of respect for the work put forth by their counterparts at the opposing school. This has been the case for many years as the bands salute each other often during halftime shows and many of the members are friends with each other from high school or drum corps. Purvine said it would be exciting to highlight both the rivalry itself and the bands a bit more through other events, like a battle of the bands or pregame showcase involving both ensembles. Student organizations within the bands have their own traditions as well, which often focus more on what they have in common than what goes down on the field. No matter which team comes out on top, emotions run high for all the fans and band members in attendance. Kwaku shared one of his favorite memories, which occurred after a loss for Texas in 2014. Kwaku added that the tradition and upholding of the rivalry on both sides has always impressed him.